Modern computers use a combination of volatile memory and nonvolatile memory to operate. The nonvolatile memory is data that is permanently stored on the hard drive of a computer and will remain there after the unit is powered down. Volatile memory is the data that is stored in memory within the RAM and is deleted or lost when a computer loses power. The issue with RAM is that it takes a lot of power to store data for temporary use. Though this data is accessed faster than permanent ROM data, it is a considerable energy investment to use, especially when you consider that more and more data is being moved into cloud servers. To prevent stack overflows, servers need enough RAM to process requests and also need to be elastic enough to handle both low and high volume traffic. Dr. Tobias Kosub and Dr. Denys Makarov of the Helmholtz-Zentrum Dresden-Rossendorf (HZDR) are taking a new approach to RAM to produce a system that offers a 50-fold power reduction. As opposed to conventional ferromagnetic systems, they debut with an antiferromagnetic magnetoelectric random access memory (AF-MERAM). There are several different types of magnetism. Interestingly enough, all matter is magnetic, but some matter displays a greater, more intense magnetic field than others. Magnetism is the result of the orbit and spin of the electrons within an atom (magnetic moment) and how all of the electrons interact with each other. In the classic horseshoe magnet, the metals used are alloys of iron, nickel, and cobalt. Within the magnet, the magnetic moments of these elements all align in the same direction, giving a North/South orientation, intensifying the magnetic field. This is ferromagnetism. In a substance that is antiferromagnetic, the magnetic moments within the crystal lattice alternate in direction. As all the magnetic moments are opposing each other, the net magnetic moment for the material is zero. By changing the order parameter, or breaking the magnetic symmetry, the zero net magnetism is ablated; this is how data can be stored as 1 or 0. The HZDR team used chromium oxide mounted on a thin layer of platinum; the chromium oxide acts as the antiferromagnetic storage while the platinum is used for reading the data. 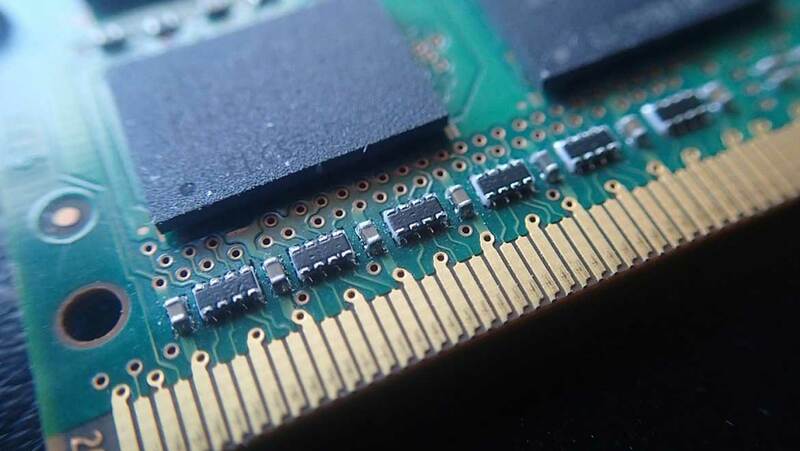 A conventional RAM chip stores data electronically. The digital 1 or 0 is placed on the chip and held there by a current. The current must be maintained to keep the data in memory. In antiferromagnetic materials, it is difficult to write data to them and to read them, but the data will remain there after the current has been dropped. To write data to the chromium oxide, the HZDR uses voltages, not currents. Thinking in terms of plumbing, the current is the flow of water, whereas voltage is the water pressure; the water doesn’t need to flow to change the water pressure. Though the voltages needed are increased, they are pulsed to write the data, which limits excessive energy waste. Another problem with ferromagnetic storage is hysteresis loss of data. Ferromagnets can retain effects from a previously applied field after it has been removed. If a new field is applied too soon, the data will be negated. Antiferromagnets do not suffer from this loss in data fidelity. The real challenge was reading the written bit of information. The HZDR physicists used a thin layer of platinum that enables data reading using the Anomalous Hall Effect. This is the effect where a voltage will develop across a metal plate when exposed to a magnetic field. So, when the antiferromagnet is at a net zero magnetic moment, there is no associated voltage. If the magnetic field is canted, a slight magnetic field will develop. HZDR team notes that the signal is very small and they are working on methods to enhance detection. The team also notes that the working chip operates at a very narrow temperature range and they are investigating methods to expand that range. Though still in its infancy, this research has shown a lot of promise. For the future, the team will try incorporating several memory elements into a single chip as well as memory arrays. The new chips would still be fabricated by methods used to produce conventional RAM.